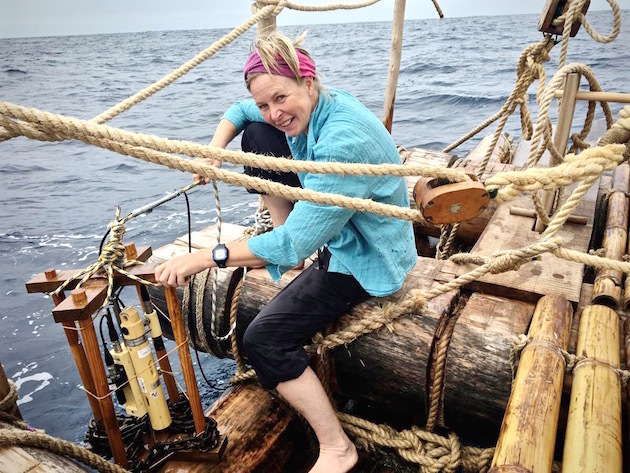 Just before the 2015 United Nations Climate Change Conference wraps up on December 11, the chief scientist of the Kon-Tiki2 expedition, Dr. Cecilie Mauritzen, published a letter online to help put oceans on the UN’s agenda. What the Ocean would have said. It is a great honor to be given the floor at the 21st Conference of the Parties here in Paris – a meeting of enormous consequences for Earth, its elements, and all its creatures, great and small. The agreements that are reached at the 2015 climate summit will have consequences for times so far into the future that only the ocean and the mountains will remember. Mauritzen, along with 14 passengers on the Kon-Tiki2, including our Chief Technology Officer Håkon Wium Lie, is mapping pollution in the Southern Pacific Garbage Patch, hoping to strengthen the case for addressing global climate change. The Kon-Tiki2 expedition has already been at sea for a month. The Kon-Tiki2 is now documenting climate change, marine life, and plastics pollution, as well as the ocean’s temperature, salinity, and chlorophyll and oxygen levels in this turbulent El Niño year. Research vessels rarely reach this part of the Pacific, putting the team in a unique position to make discoveries and help predict the effects of climate change from the middle of the world’s largest ocean.